VMC Readers of the World, Unite! There’s a lot going on! 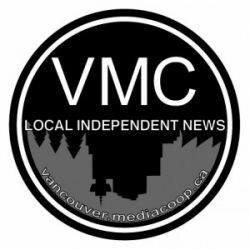 The VMC site has been chock full of great coverage so far this month, with under-reported Indigenous news from different territories and other rad stories from east Van and beyond. An in-depth article by Kerry Coast takes a critical look at the election of a BC Treaty advocate to chair the UN Permanent Forum on Indigenous Issues. A month-long series produced by the Powell River's local community radio station covers Tla'amin opinions and concerns leading up to the June 16 Final Agreement (Treaty) vote. There are video interviews with Cheam First Nation members and allies about salmon testing in the Fraser and one with Arthur Manuel speaking about Aboriginal Title. In a special series funded by the VMC, a correspondent is heading to Saskatoon for ongoing coverage of the legacy of the residential school system and the Truth and Reconciliation Commission. Inside city limits, in Musqueam territory, a video covering the Day of Action to protect an ancient village and midden site was posted. The action heated up two days later with a protest blocking the Arthur Laing bridge. VMC contributor Murray Bush has continued to post regular updates, one of which went up on The Dominion last week. On the mining resistance front, there’s news about Greek protests against Vancouver-based Eldorado Gold, actions against Compliance’s proposed Ravel Coal mine, and the Shout Out! conference on mining injustice which took place earlier this month. And there’s always room for more! The Vancouver Media Co-op is reader funded, collectively run, open publishing and always looking for more people interested in critical, participatory and democratic media in Vancouver and beyond. Along with other local Media Co-ops in Halifax, Toronto and Montreal, we're part of a national network that wants to hear about your summer story ideas for coast to coast coverage. Want to post, edit, suggest a story, organize or just get rid of all those pesky wads of cash weighing you down? Drop us a line at vmc (at) mediacoop.ca, check out the ‘About’ info on our site, follow us on twitter or facebook, or come and say hi in person! Our next meeting is this Wednesday, June 20, 6:30pm at Spartacus Books (684 East Hastings, between Heatley and Princess).